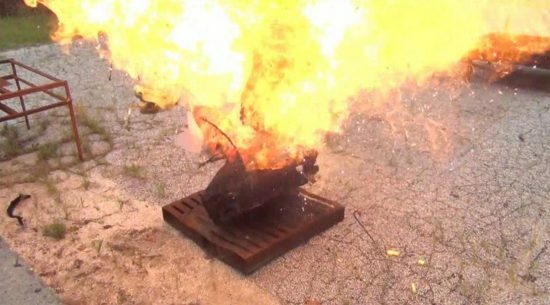 FAA fire test of laptop battery thermal runaway with aerosol can in suitcase. On 5 April 2017, EASA published SIB 2017-04 to alert operators on the risks associated with the carriage of Portable Electronic Devices (PEDs) in the checked baggage, and to recommend mitigating actions when the carriage of large PEDs in the cabin is prohibited. PEDs containing lithium batteries carried by passengers should be carried in the passenger cabin, to enable the crew to react expeditiously in case an incident involving such a PED occurs. Recent testing performed by the FAA showed that if a thermal runaway event occurs to a large PED carried in a checked baggage together with flammable materials, such as hair spray, there is a poor chance that a Class D cargo compartment could contain the resulting fire, and a fair to poor chance that a Class C cargo compartment could contain it. Make the carriage of large PEDs in checked baggage in Class D cargo compartments subject to measures effectively mitigating the associated risks. Furthermore, where carry-on bags are put in the hold (e.g. due to the lack of space) operators are reminded to ensure that passengers are requested to remove from the bag any spare batteries or e-cigarettes.